Jesus “Chuy” Garcia's campaign to replace Chicago Mayor Rahm Emanuel doesn't present a real break from neoliberalism. There’s no question: it would feel great to dump Rahm Emanuel in Chicago’s mayoral runoff on April 7. Unless you’re an investment banker or real-estate developer, the image of Emanuel being ejected from City Hall by angry voters ought to bring a smile to your face. But there’s an important lesson here that progressives and leftists are being encouraged to ignore: the fact that Emanuel is a menace to working people does not make his challenger’s campaign any more or less progressive than it actually is. Before we can say anything useful here we need to back up for a moment: what exactly do we mean when we say “progressive”? This seems like as good of a definition as any: a progressive is someone who opposes social injustice and inequality, who stands for the interests of the many rather than the privileged few. That means taxing the rich instead of eviscerating public services and standing in solidarity with the marginalized instead of protecting those who already possess great wealth and power. Above all, it means opposing any measures that harm or disempower the majority in order to advance the interests of those at the top. A few outliers notwithstanding, it is obvious to anyone who has paid any attention to Chicago politics over the last few years that the policies of Emanuel and his loyalists are not progressive in the least. His crowning achievements as mayor include: mass school closures, tax increment financing giveaways to corporations, privatization of public wealth, and racist policing practices. All of these measures advance the interests of the wealthy and powerful at the expense of the working-class majority. So there’s no mystery about why many on the Left — especially public school teachers and other city workers under the gun — wants to get rid of him. But the desire to knock Emanuel off his throne shouldn’t be counterposed to the need to take a sober look at the other candidate on the ballot. So what does the challenger, Cook County Commissioner Jesús “Chuy” Garcia, have to offer progressives besides having a name other than “Rahm”? What we’ve seen so far from Garcia isn’t promising — a fact that is doubly alarming considering Democrat politicians can always be counted on to promise us more during campaign season than they will deliver once in office. Consider the financial plan Garcia’s campaign released earlier this month. Those who attack Garcia on the grounds that he has no concrete economic program — or defend him on the grounds that he doesn’t need one — would do well to read the document carefully, which puts forward a very clear plan for the city. Written in bloodless, technocratic language, the plan eschews the “neighborhoods versus downtown” populism Garcia favors at campaign rallies. Rather than faulting Rahm for his embrace of austerity, the document identifies wasteful, imprudent fiscal management as the fundamental problem facing Chicago. His solution is to cut back on the public sector, eliminating more city and county jobs and consolidating departments. Likewise, while Garcia also gave a weak endorsement of replacing the state’s flat income tax rate with a graduated tax rate at the same event and has voiced some support for such a change in the past, a state-level progressive income tax has been largely absent from the campaign thus far. But unless the city raises new revenue by taxing the rich, we can be sure that more austerity is on the way. So, let’s sum up: Garcia is proposing a new round of cutbacks and, possibly, a regressive tax increase that hurts the very people — working-class Chicagoans who rent or own their homes — that the campaign is supposed to champion. To be sure, Garcia is promising to consult the public more and take a less confrontational approach while pursuing these policies. But, mood music and style aside, these are not progressive goals. The county commissioner’s proposals would continue the longstanding practice of reducing the standard of living of the majority of Chicagoans — whether through more layoffs, cutbacks, or regressive tax increases — for the benefit of downtown. Instead of fleecing working-class Chicagoans “with red light cameras, cellphone taxes, parking fees, and increased utility bills,” Lewis argues, we need a “fair tax where the wealthy pay their share.” These are progressive demands that resonate with the vast majority of Chicagoans, but they are nowhere to be found in Garcia’s plan for the city. But that simply isn’t true. Progressive measures such as a modest tax on transactions at the Chicago Mercantile Exchange are as feasible as they are popular. Estimates indicate that even a tax as low as $1 per transaction would have the potential to generate billions in revenue. This and similar measures — e.g., a luxury tax on big-ticket assets owned by the wealthy — would not delight the privileged denizens of the Civic Committee of the Commercial Club, but they would appeal to the majority of voters. So, too, would working-class voters support an aggressive, public challenge to the Democrat-controlled state legislature that continues to uphold one of the most regressive income tax systems in the country. We have every right to demand measures like this from a mayoral candidate who has repeatedly stated that he is running at the behest of Chicago’s social movements. So why hasn’t Garcia’s campaign taken this more progressive road? The answer can’t be that the campaign’s rank-and-file supporters and volunteers would object if he did — on the contrary, many voters are flocking to Garcia in the hope that electing him will bring the city closer to defeating austerity. The more likely answer is that his campaign is hemmed in by the conservative institutional machinery of the Democratic Party. To see what I mean, first consider that it is conventional wisdom among Democratic strategists that you win elections by tacking to the center, reaching out for partnerships with certain sections of big business, and using modest doses of populist rhetoric to rally the troops on the ground. Instead of challenging the neoliberal consensus, you maneuver within it. This was the strategy adopted by the “We Are One” campaign in Wisconsin to try to recall Scott Walker — and it resulted in a disastrous defeat. Some of the same strategists behind this failed campaign are playing a leading role in shaping Garcia’s mayoral campaign. It’s also important to keep in mind that the Democratic Party has governed Chicago in a neoliberal fashion for generations — privatizing public wealth, wrenching concessions from city workers, cutting back on social services, doling out subsidies and tax breaks to big corporations, and so on. While there have always been internal disagreements over the details, the overall framework has been hegemonic. The dominant ethos in Chicago city government is also administrative and top-down, rather than political and participatory. To advance in a party like this, as Garcia has, one has to swim with the tide to some extent. And, his credentials as a community organizer and Harold Washington ally notwithstanding, this is not the sort of experience that lends itself to challenging austerity. Of course, financial plans aren’t everything. Education policy, policing, and many other issues deserve the spotlight too. But no matter which issues we’re examining, progressives damage their own cause when they gloss over difficult truths in order to get a powerful incumbent out of office. I won’t shed any tears if Emanuel gets the boot on April 7. But neither will I pretend that what Garcia is offering is the best we can reasonably hope for in the here and now. It’s not. We can, and must, demand much more if we’re to have any hope of breaking the chains of austerity and moving Chicago, and the US, in a different direction. 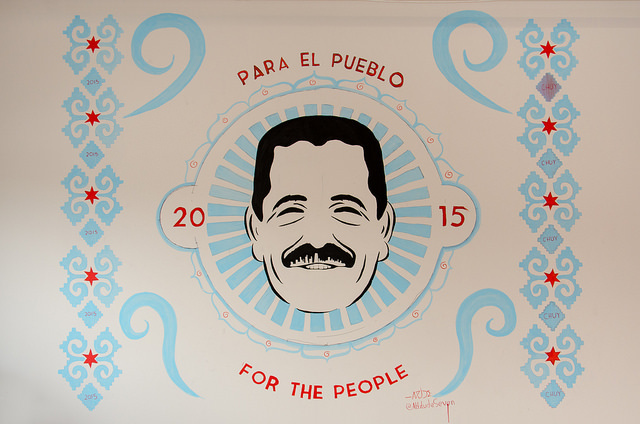 Jesus “Chuy” Garcia’s campaign to replace Chicago Mayor Rahm Emanuel doesn’t present a real break from neoliberalism.